Come support the Salemwood school at the first annual Trivia Night held at Anthony’s. Tickets are $25 a person or $250 for a table of 10. Tickets must be purchased in advance. Contact Jane Wright at Salemwoodtrivia@gmail.com to purchase tickets. Cash and Checks are accepted. Checks should be made payable to the Salemwood School. 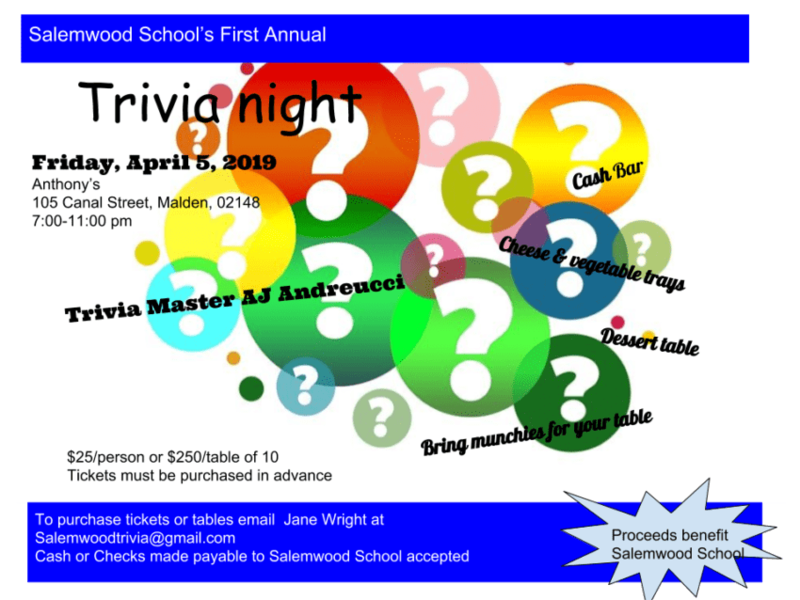 https://i1.wp.com/maldenps.org/salemwood/wp-content/uploads/sites/3/2019/03/Salemwood-trivia-night-e1552911968970.png?fit=850%2C638&ssl=1 638 850 Natalia Brennan http://maldenps.org/salemwood/wp-content/uploads/sites/3/2015/09/salemwood.png Natalia Brennan2019-03-18 08:26:562019-03-18 08:26:56Salemwood Triva Night!